Haha! I love this T-shirt. The funny thing is that it took me a moment to realize the joke. that just made my day!!! Thanks!!! That is something I need. Like, right now. I love this! This ist totally mein Leben! It says, the moments when you start thinking in two languages at the same time. It is written starting in German and alternating English and German. So if you can read it you are understanding two languages. Just read the alternating sentences to read the English and you'll see. Der moment is the moment. D e n k e n is to think. (I've inserted spaces because spellchecker is changing my words.) z w e i is two. Sprachen is speak. Z e i t is time. If you had put it into google translate you might have found the answer. "The moment when you start thinking in two languages at the same time." 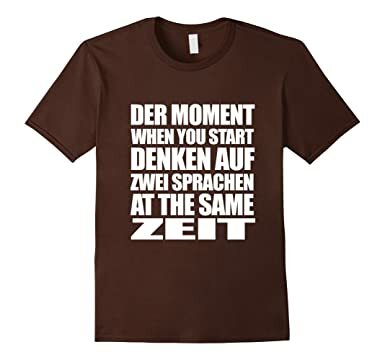 I think "Der Moment when you start auf zwei Sprachen zu denken at the same Zeit" would work better. Now THAT is exactly the one I need! I would love to tutor German. I love duolingo! it rocks ! Jump to Level "X" - Love it! I love German Compound Words!!! I am in love with this site... too pity that I did not find out it earlier!